Sometimes the best way to get the point across is with humor. A couple posts in the last couple of days are doing just that and exposing a little about how people use Facebook along with the current social media landscape. A comic / writer / designer put together this flowchart Fast Company Design in the article Infographic of the Day: A Flowchart of Facebook Portrait Styles. The article dissects the Facebook profile photo to provide insight into the personality of the profilee. All of this is nicely woven with a flowchart outlining the most common types of photos (the Self-Shot, Using Mirror, Bathroom, Dead Robot Eyes path strikes a little close to home on profiles of folks who sorta-stalked me). I have used all four levels of zoom, if anyone cares. The cultish online comic xkcd has a new version of its Map of Online Communities today. Unlike previous comics on this theme (see xkcd’s original map, followed by Flowtown’s capitalizing-on-someone-else’s-idea version), this one is far more detailed and includes some explanation for its modeling, probably owing to how broadly this has been shared across the social media world. If you don’t believe me, Mashable was all over it this morning, and clearly so am I (although I started this post before I saw Mashable’s post, so I’m not a big fat copycat). We can see that my blog would probably be on the shores of the Sea of Opinions in the region of Blogosphere in the Tech Blogs peninsula. Maybe I’m just renting a flat on the border of Gizmodo? This isn’t keeping in line with social media, but is keeping in line with humorous imagery to explain concepts that themselves might be absurd. 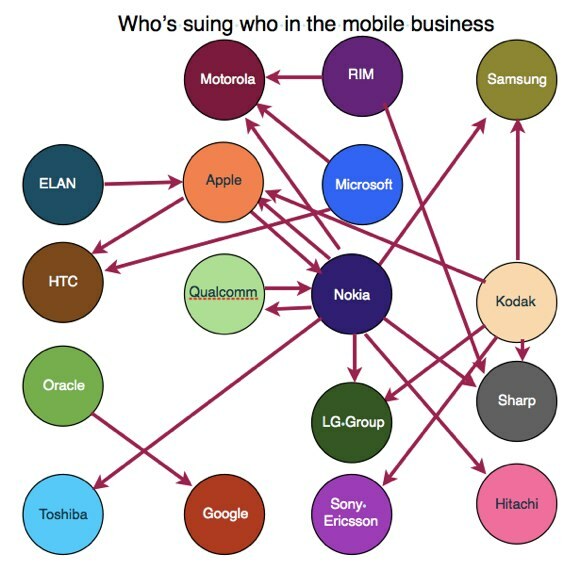 The Guardian covers who’s suing who in the mobile space in this nice graphic in the post Microsoft sues Motorola over Android – and all the other mobile lawsuits, visually. The graphic simply illustrates how much of a mess it is out there as each company tries to assert some claim to what is clearly becoming the place to be. 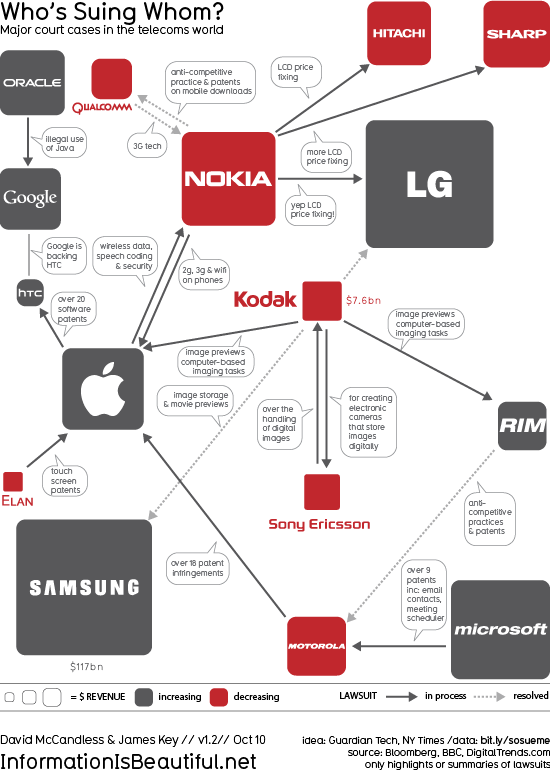 Not to be outdone, and motivated by the New York Times article/graphic and the Guardian article/graphic (above, although you should follow the link because the graphic has been updated), Information is Beautiful came up with its own infographic in the post Who’s Suing Whom In The Telecoms Trade?.